This computer was donated to my collection along with some software on the now almost impossible to get 3" disks. However it seems to have a faulty disk drive, switch it on put the disk in and it just sits there doing nothing. This solution provided by Ron Haller-Williams. 1. Switch off and unplug, then wait at least 5 mins (EHT safety). 4. Remove 4 screws holding drive outer casing. For this and step 2 you will need a long slim s/driver pozi #1, carefully noting any grounding (black) wire. Then remove the 4 screws holding outer casing to drive (philips #2). Outer casing has inner & outer parts, note carefully how they fit! 5. Use a cardboard box or something so that by re-plugging the power and ribbon cables (!!!orientation!!! ), you can run the machine with the drive innards visible. 6. Do so, no need for a diskette, but be careful not to get a fistful of the 12KV tube anode voltage. 8. Switch on - I bet this will not turn, showing stretched drive belt !!! 9. Switch off, disconnect. If I am right, do steps 10-15. Else curse loudly and just do steps 13-15. 10. Unplug the drive again and remove 2 screws (philips #1) holding large PCB of the drive in place. This will give access to the belt. 11. Replace the belt with a good one - try hi-fi or electronic stores etc. You want 3mm to 3.2mm (0.125 inch or a bit less) by very thin by some 215mm to 220 mm (8.5 to 8.7 inches). But check this for yourself!! If you cannot get locally, see SD Microsystems LTD web page at http://come.to/sdmicro where they offer drive service kit for £12.95, (includes belt, cleaning pad, cleaning fluid). 12. Carefully replace the drive main PCB and 2 screws. 13. Carefully replace the drive outer casings and 4 screws. 14. Re-install the drive (4 long screws, 2 cables, ground). 15. Replace the rear cover (care with power lead, kbd skt, and general-purpose edge connector) and 6 screws. 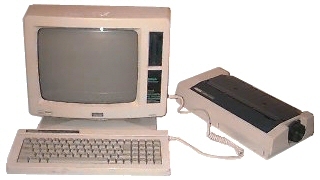 SD Microsystems LTD With over a decade of experience in supporting Amstrad computers from the CPC 6128 through the PCW range (8256/8512/9512/Plus/9256/10) to the PC 1512/1640/2086/286/386 and so on. They can still supply a wide range of software on 3", 3.5" or 5.25" disc and essential supplies such as blank media. Amstrad PCW Computer Site Offering machines, software, spares, hardware, parts, links, disc transfers, free advice and PCW club details. Holland Numerics Limited This service provides conversion/copying of data files between PCW 3", PCW 3.5", PC 5.25", PC 3.5" and Mac 3.5" diskettes.